One of the major promoters of the Nigerian fashion industry is calling all private sector practitioners, textile companies, retailers, & manufacturers, fashion retailers, luxury fashion brands, designers, and fashion entrepreneurs, for the 2016 Fashion Business Series which will be happening on the 15th of April! Hosted by Style House Files, founders, Heineken Lagos Fashion and Design Week and sponsored by PAL Pensions and theNigerian Export Promotion Council (NEPC), the Fashion Business Series is a forum for exchanging ideas, networking and exploring strategies to grow the industry. This year’s edition is themed, “The Future of Fashion”, and it will touch on critical sectors of the fashion industry such as manufacturing, retail, e-commerce, PR, communications and more. Industry stakeholders will discuss on varied topics including: ‘Retail and ‘Etail’: Maximizing Opportunities and Reducing Risk’,‘Communicating Fashion’, ‘Exporting Fashion to the World’ amongst others. Facilitated by PAL Pensions, FBS will also feature a VIP Signature Session, titled “The Next Level”. Open to fashion entrepreneurs operating for a minimum of five years, the session will host thought leaders in Fashion and the Private Sector as they discuss how to build a sustainable business. 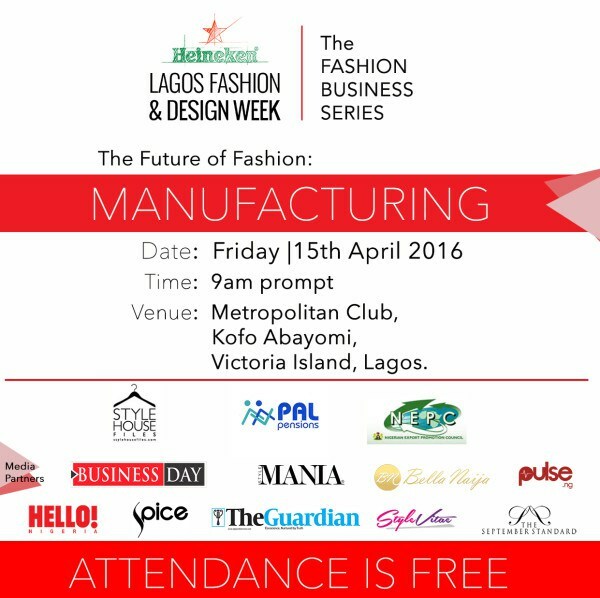 The Fashion Business Series will hold on the 15th of April 2016 at The Metropolitan Club, Kofo Abayomi, Victoria Island, from 9am – 4pm. Previous Post Donate Shoes For These Kids And Help Protect Their Feet! Next Post Dakore Egbuson Akande Covers Blank Magazine Spring/Summer 2016 Edition; Speaks On Keeping Fit & Loving Your Body!